Despite my hopes of getting some pictures up here of our (awesome) house switcharoos, the true fact of the matter is that the house has gone backwards this week, looking even more like we just moved in and have not in reality been living there for 8+ months. But sometimes things get worse before they get better, right? This weekend we don’t have many plans, other than heading into Broad Ripple to enjoy the first Colts game of the season at some or the other bar, so I’m hoping to get things straightened up and get some nice pictures for you. In the meantime, I thought I’d give you a quick update about a very exciting occurrence in our life! 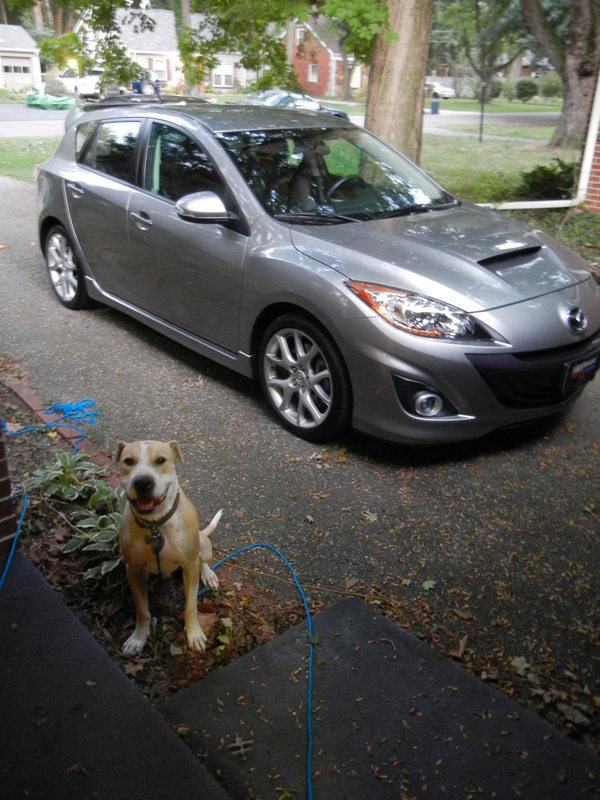 On August 27, Paul and I became the proud owners of a Mazdaspeed3 (Yes, I’m pretty sure it is supposed to be all one word like that. Yes, I also think it is weird) This is the first major purchase we have made as a married couple! It’s a 2011, but gently used, and still has the new car smell. We’re pretty sure it got repossessed, which is a bummer for someone out there, but we’re glad to have it. This particular car is only made in Japan, so they have been in short supply since the earthquake/tsunami, and we were lucky to get our hands on one. I also think it’s kind of neat that it came over on a long boat ride, but I’m also kind of a dork. At the used car dealership, they just happened to have a MiniCooper on display, and it was yellow, so naturally I had to drive it. It was SO much fun, and that put me in a “I’m young. I don’t have kids. Maybe I need something fun” mode. After that, I was pretty much sold on el yellow Mini, but felt like the wisest thing to do would be to do a bit more research, see how much other similar Minis went for, etc. We were pretty much in a “Let’s do it” mindset, when Paul suggested that we go to the Mazda dealership and just try a Speed3. It had been on his list of “super awesome fun cars” since the start, and we hadn’t actually ever driven one. The Speed3 (not the regular 3) has a manual transmission and a turbo charger, so it’s really fast and a lot of fun to drive. Paul could probably give you a better description, but this will have to do for now. More about the house to come this weekend!